Born 1937. M.Sc., University of Moscow 1958. Ph.D. (Candidate of physical and mathematical sciences), Steklov Mathematical Institute of the Russian Academy of Sciences, Moscow, 1960. Habilitation, Steklov Mathematical Institute, Moscow, 1963. Principal Researcher, Steklov Mathematical Institute, 1960-1993; since 1993 Principal Researcher in absentia. Professor (Algebra Chair), University of Moscow 1965-1992. Professor, M.I.T. 1992-1993. Scientific Member, MPI for Mathematics since 1993. 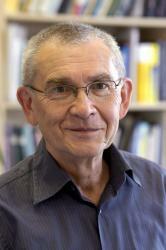 Director, MPI for Mathematics 1995-2005, now Professor Emeritus. Board of Trustees Professor, Northwestern University (Evanston, USA) 2002-2011, now Professor Emeritus. Lenin Prize 1967. Brouwer Medal 1987. Frederic Esser Nemmers Prize 1994. Rolf Schock Prize in Mathematics 1999. King Faisal International Prize in Mathematics 2002. Georg Cantor Medal 2002. Order pour le Mérite for Science and Art, Germany, 2007. Great Cross of Merit with Star, Germany, 2008. János Bolyai International Mathematical Prize, Hungarian Academy of Sciences, 2010. Member of nine Academies of Sciences. Honorary degrees at Sorbonne, Oslo, Warwick. Honorary Member of the London Math. Society.